Put the butter outside the fridge to soften 30 minutes before starting the recipe. Cut the butter into cubes and put in the electric mixer. Mix until the butter becomes creamy and turns white. Add the sugar, and then add the cocoa powder and the Nutella. Mix until it becomes homogeneous. In a separate bowl, break the egg; add the vanilla and the salt. Wisk with a fork and add to the electric mixer. Start adding the flour gradually, half a cup by half a cup—you can continue using the electric mixer. When you feel that the dough is getting stiffer, add the flour, mix and knead with your hands. Form 2 big balls of shiny chocolate cookie dough, set them on a plate and cover really well with a cling film and put it in a plastic bag. Refrigerate for at least 20mins. Preheat the oven at 120ᴼC. When the cookie dough is ready, make sure your table is clean and prepare the nylon sheets, the rolling pin, and the moulds. When the dough is cold, it is more friable and crumbly so work the dough a bit with your hands to prepare it well for the stretching exercise. Form a small ball and put it in between the nylon sheets. Press on it a bit and start stretching the dough up and down left and right until it becomes equal at all levels. The cookies should be around half a centimeter thick, (or 5 mm). Cut the dough with the stencil and press gently on the back of the nylon sheet to remove the cookie. You should be very careful and delicate in your hand gestures for this step because the cookie dough can break easily. 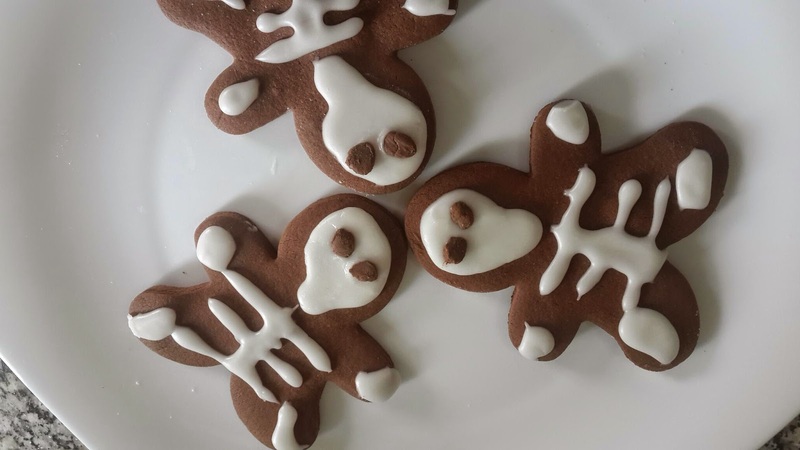 You can also make mini gingerbread man skeletons! Put the gingerbread-man-like cookies on a mould and bake in oven for around 5 minutes but not less. P.S. No need for a baking sheet or greasing the mould since the dough is already essentially made of flour and butter. 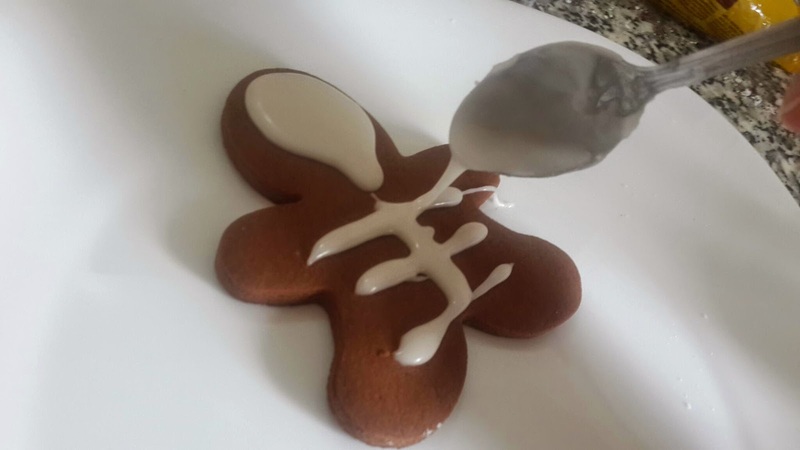 No worries, they are very easily removable from the mould once baked. Moreover, the reason why I included two moulds in the cookware and cutlery section is for the time we let the first batch cool down in their mould while baking the second batch. it is more efficient that way, but you can still use one mould. Let cool in the mould for a few minutes before disposing them on a tray covered with greaseproof paper. Mix the powdered sugar, with the water, and the vanilla essence. Add 5 tbsp of water, but depending on the consistency of your mixture, if you feel that the icing is too thick, add the 6th tbsp of water. Mix well in order to form a homogeneous paste. So, the steps for drawing the skeleton on the cookie are not easy but it’s not complicated either. You just need to focus really on what you’re doing. I advise to look at mine for help. First, make a circle on top of the cookie’s head and let it sit down slowly. Add a little circle below it as to for the chin. For the body parts, separate the body with a line and add 3 somehow perpendicular lines. But don’t be too square or perfect, it will show on your cookies! Have fun with it. Add the arms in the form of a fat dot and the legs in a longer dot form. P.S. The first cookie that I designed didn’t resemble a skeleton really. In fact, that was the case for the first three! But practice makes perfect and starting the fourth one I got it right for all the rest. In order not to waste your good cookies, I advise you to start trying on the unlucky burnt ones, (believe me that it is highly probable that you will forget one batch in the oven or bake them too long the first time! Don't forget to add the chocolate chip cookies for the hollowed eyes! You can squash them a bit with your fingers if you feel that they are too big. The icing will harden fast on the cookies but you still can’t stack the cookies on top of one another in a box. Eat the cookies right away or conserve them in a wide straight plate covered with a cling film.